Cameron Reddish scored 34 points and the Westtown boys’ basketball team won its fifth straight Friends Schools League title with a 75-57 win over Shipley on Friday. 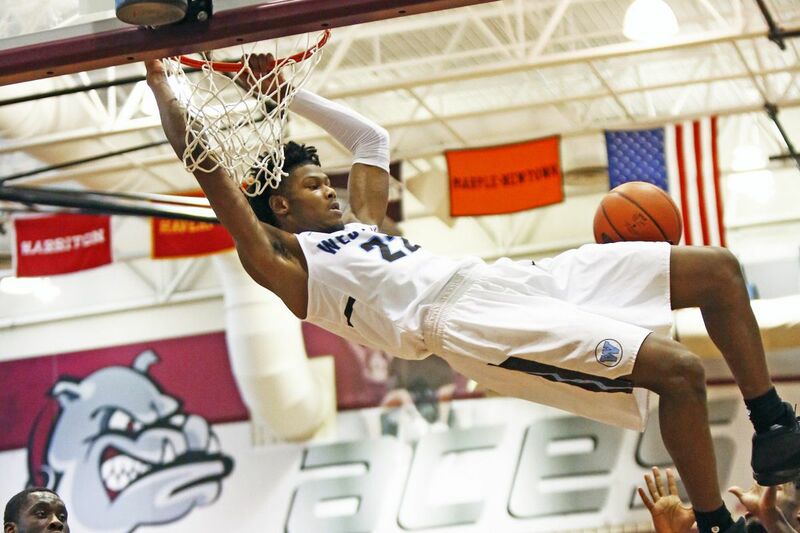 Duke recruit Cameron Reddish scored 34 points and the Westtown boys' basketball team won its fifth straight Friends Schools League title with a 75-57 win over Shipley on Friday. Sam Sessoms had 23 points for Shipley. Kureese Rogers and Stavin Tukes had 17 points apiece as Frankford beat Olney, 71-64, in Bracket B of the Public League playoffs. Tukes also had 12 rebounds for the Pioneers, who will face Math, Civics and Sciences on Tuesday. Math, Civics and Sciences took down Penn Treaty, 90-59, on Friday. In other Bracket B action, Jamar Hamilton's putback at the buzzer gave Mastbaum a 73-71 overtime win over Southern. Mastbaum advances to face Lincoln, which beat Strawberry Mansion by an 86-44 margin. William McNair Jr. and Ricardo Montereiro recorded 19 and 17 points, respectively, as Martin Luther King cruised past Mastery South, 77-42, in Bracket B play. King will play Boys' Latin on Tuesday. Lakeem McAilely scored a game-high 21 points as Mastery North rolled past Dobbins, 75-36, in Bracket A action. Next up for Mastery North is Simon Gratz. Dymir Montague filled the stat sheet with 14 points, 10 rebounds, and 10 assists to lead Neumann-Goretti past St. Joseph's Prep, 71-67. The Saints made 10 three-pointers. Garnet Valley defeated Conestoga, 53-50, thanks to Cade Brennan's three-pointer at the buzzer. The Jaguars will play Lower Merion in the Central League semifinals on Sunday at Marple Newtown. Taalib Holloman netted 19 points as Abington Friends captured its second straight Quaker Cup title with a 71-54 triumph over George School. Shanice Boyd notched 15 points, 17 rebounds, and 11 blocks as Parkway Northwest held off Dobbins, 57-39, in the Public League playoffs. Elsewhere in the Public League playoffs, Quameerah Gray's 29 points guided Math, Civics and Sciences past Mastbaum, 53-23. Ziairah Grant had 23 points, seven assists, and seven steals as Motivation advanced with a 47-36 victory over Paul Robeson. In other Public League playoff action, Thays Torres netted 23 points in Edison's 44-41 win over Southern. Emily McAteer scored with 17 seconds left to give Garnet Valley a 49-47 triumph over Conestoga. The Jaguars finished the regular season 20-2 overall and 16-0 in the Central League. Lauren Fortescue scored her 1,000th career point as Plymouth Whitemarsh dominated Quakertown, 71-9. The Colonials went undefeated in the Suburban One League American Conference for the second straight season. Abington Friends won its second straight Friends Schools League championship with a 42-24 win over Moorestown Friends. Mihjae Hayes and Kendall Hodges each had 12 points.